Lawbore offers materials for study and lots of ways to keep you up-to-date with what’s going on at City and the legal world beyond. The City Law School has its very own legal portal, Lawbore. This offers key resources to support your study including: materials for study, innovative guides and tutorials and lots of ways to keep you up-to-date with what’s going on at City and the legal world beyond. Lawbore is a great way to find out what it's like to be a law student at City. The portal's key purpose is to help you track down key resources to support you in your study. The Directory offers links for each of the subjects studied to recommended websites, journal articles, reports, cases and key papers. 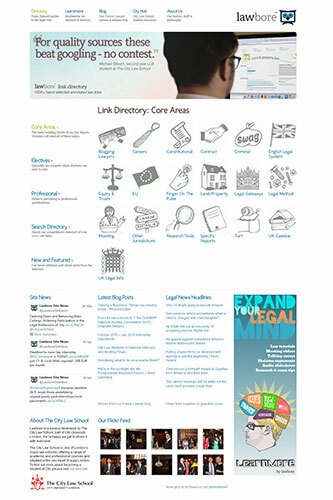 City Hub is the community part of the site; offering links to the legal databases, details of upcoming law events, the e-library and current awareness news, as well as the Lawbore Twitter feed. 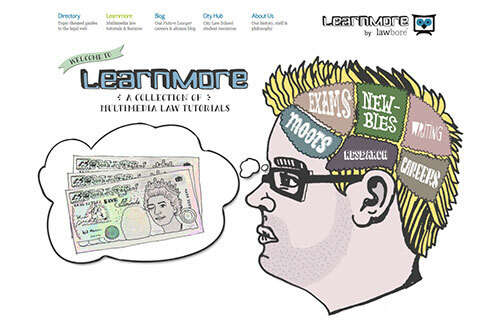 Learnmore is a collection of multimedia law tutorials; containing online resources, video guides and talking slide shows on a range of subjects from mooting, study skills, using a law library, legal writing, doing exams to pro bono. Many of the resources have been compiled in collaboration with students at City to ensure we have the best guides out there for our students. Lawbore has received various national awards; its creator Emily Allbon (Lecturer) being named Wildy/BIALL Law Librarian of the Year 2012 in her previous career. Her work developing Lawbore also lead to a National Teaching Fellowship and the Routledge/ALT Teaching Law with Technology Prize 2013 (in collaboration with fellow lecturer Sanmeet Kaur Dua). Mooting is a key activity for many of our students – you can find a new Lawbore Mooting site outlining the competitions we’re involved in, as well as mooting-related news stories. Lawbore Future Lawyer focuses on the career routes available to law students. The blog also offers an insight into the paths our alumni have taken via articles and video interviews. Wehave a student team reporting on City events, and pieces from our academic staff, legal journalists and careers experts. Find out more about the philosophy of Lawbore.